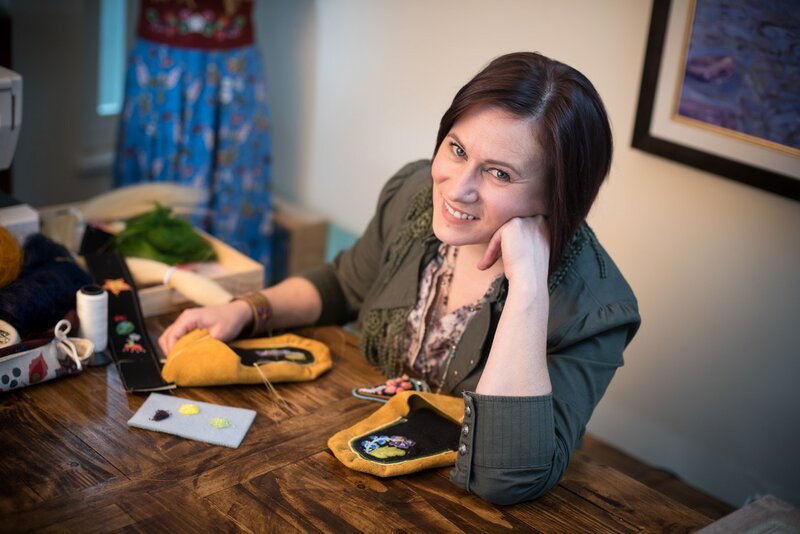 Born and raised in Alberta, Lisa Shepherd migrated west to British Columbia, where she now lives and creates one of a kind award winning Métis garments and fine art works. As a wee child, the artist fondly recalls visiting her Grandparents, where the budding artist was given small stacks of fabric, a needle and thread, some paper and pencil crayons. The gifts received inspired many happy hours designing, sewing, and forming her interest in textile arts. It came as no surprise to her family and friends when Lisa garnered an art bursary and moved to the coast to study apparel design. Today, the designer is best known for her one-of beaded garments that pay tribute to her Métis roots. Her contemporary studies of native plants and her exploration of the padula flowers in ancestral works land thoughtfully by way of beads on velveteen, stroud and smokey hide. She works with a meticulousness that can only come from an artist’s desire to unearth an almost lost history, bring it into the present and explain it to a searching generation. Lisa’s work can be found in the permanent collections of the Royal Alberta Museum, Jasper Yellowhead Museum and Archives, Gabriel Dumont Museum and Archives, the National Music Centre and in private collections.